Kids will enjoy Tarn Taran Sahib and Dukh Bhanjani Ber Tree. There's still lots to do: contemplate in the serene atmosphere at Gurudwara Bir Baba Budha Sahib, take in nature's colorful creations at Jallianwala Bagh, don't miss a visit to Akal Takht, and pause for some photo ops at Serai Amanat Khan. 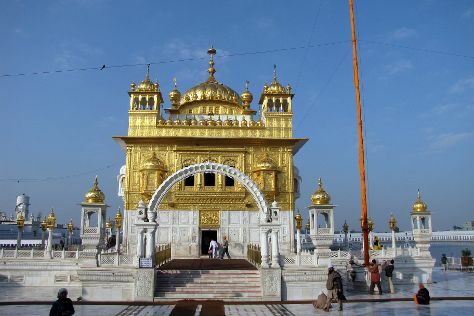 To see ratings, other places to visit, and tourist information, read Amritsar trip planning website . Ahmedabad to Amritsar is an approximately 4-hour flight. You can also do a combination of train and flight; or drive. Expect slightly colder temperatures when traveling from Ahmedabad in November; daily highs in Amritsar reach 30°C and lows reach 11°C. Finish your sightseeing early on the 25th (Mon) so you can drive to Manali. Kick off your visit on the 26th (Tue): find something for the whole family at Manali Picnic Spot and Camps. Here are some ideas for day two: explore the activities along Beas River, find something for the whole family at Himvalley Manali Amusement & Culture Park, and then take in the spiritual surroundings of Hidimba Devi Temple. For where to stay, ratings, reviews, and more tourist information, refer to the Manali tour itinerary planner . Drive from Amritsar to Manali in 7 hours. Alternatively, you can take a bus; or do a combination of train and bus. Cap off your sightseeing on the 27th (Wed) early enough to go by car to Shimla. You'll visit kid-friendly attractions like Mohan Shakti Heritage Park and Sankat Mochan Temple. You'll find plenty of places to visit near Shimla: Naldehra Golf Course (in Naldehra) and Craignano (in Mashobra). There's lots more to do: make a trip to The Mall, pause for some serene contemplation at Christ Church, take in the spiritual surroundings of Jakhu Temple, and walk around Annandale Ground. For traveler tips, photos, maps, and tourist information, go to the Shimla trip itinerary planner. You can drive from Manali to Shimla in 4.5 hours. Alternatively, you can take a bus. Wrap up your sightseeing on the 30th (Sat) early enough to travel back home.